Catch Zest and Yearn for You! COOL AND UNIQUE DRAGON DESIGN: These dragon pencil boxes are made with soft PU leather and printed with textured dragon skin. Best of all is that the 3D glass cabochon eye… it sees right through you. Each pencil bag is unique! LARGE CAPACITY: This pencil holder has one big compartment roomy enough for pencils, brushes, a ruler, pens, and reading glasses, which is everything you need. And it's also an ideal organized pencil case for travel, perfect to put in any of your backpack or tote bag. WELL CRAFTED: Nice stitching, triangle style, metal zipper, and fleece lined. The zipper glides back and forth very smoothly. These make this novelty pencil case durable and gets beautiful over time. VERSATILE: Our CZYY pencil pouch has a large pouch for storing all of your writing tools, making it perfects for an architect, student, or artist. But it's not just for pencils - get creative! You can use it to store makeup and brushes, small electronic accessories earphones and cables, and so much more. SHOW YOUR PERSONALITY: Express yourself! 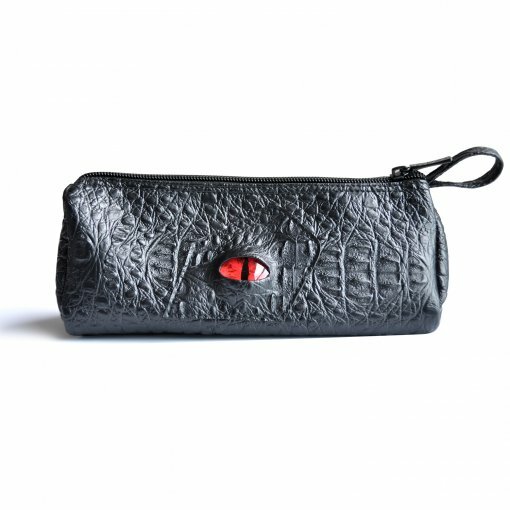 Be the talk of the schoolyard or office with this awesome 3D dragon eye pencil case! This funny pencil case also could be an ideal gift for kids, artists or D&D gamers. With the leather name tag, CZYY Pencil Case is a great way to personalize your space. Carry your favourite stationery and personal items so you have what you need, no matter where you sit down to work. Copyright © 2016-2019 CZYY INC. All Rights Reserved.